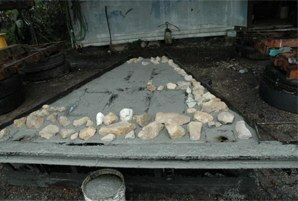 Creating a Memorial Reef is a rewarding and lasting experience. 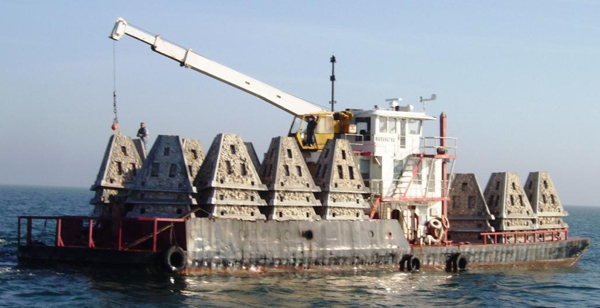 We have over 15 years of experience in designing, creating, deploying and monitoring Memorial Reefs, and we are proud to be affiliated with some of the most trusted and respected artificial reef makers in the Southeast. The Memorial Reefs have been designed and developed after decades of research and experience. Our Reefs have withstood the strongest storms the Gulf can produce, while creating vast and productive marine ecosystems.Our Reefs are constructed at the Walter Marine facility in Orange Beach, AL. 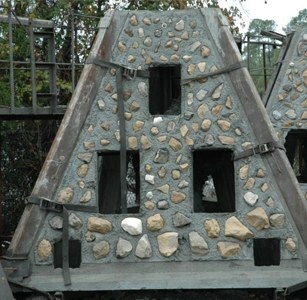 OAR Memorial Reefs can be created in days; steps typically consist of initial casting pour, assembly, welding, corner pour and final cure. The facility is on an intercoastalwaterway and provides a seamless transport from the construction location to the deployment vessel. 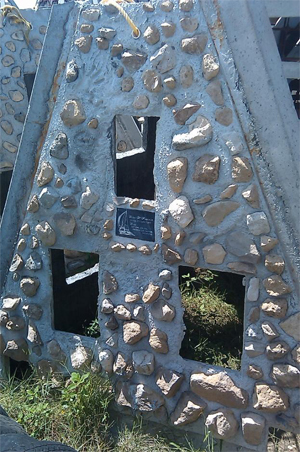 We can create the Memorial Reef months before deployment and secure it at the facility until time of deployment. Please keep in mind that if you cannot attend an event, the OAR staff will perform any or all of the construction and dedication events for you. 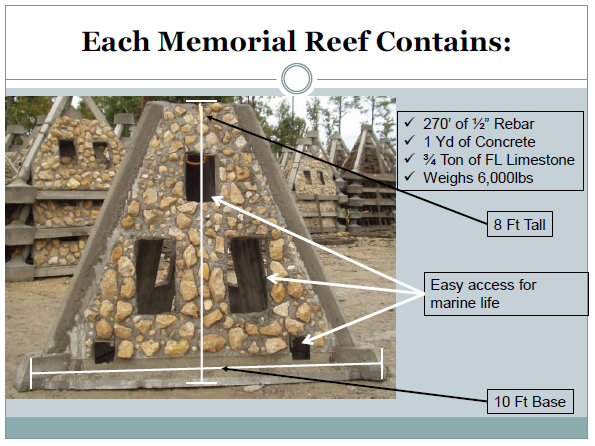 The following is an illustration of how the Memorial Reefs are constructed and deployed. Memorial Reef construction begins with pouring of one of the three metal forms that will serve as the basis for the Reef. One-half inch rebar is placed in pre-formatted slots and is extended beyond the form over 270 feet of rebar is used for each Reef. The rebar extension will be welded later in the process. 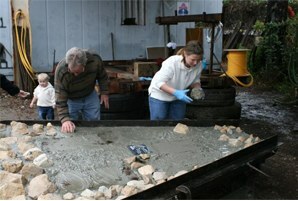 Each mold is poured and a full yard of concrete is used for each Reef. As the forms are poured, Florida Limestone is placed by hand directly into the concrete forming a permanent bond with the structure. 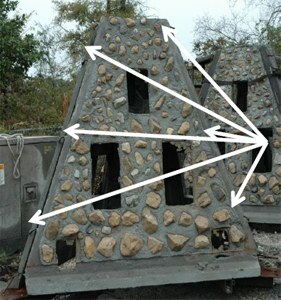 Limestone rock is believed to be the best artificial reef material and Florida Limestone is soft enough for marine worms to bore into, but hard enough to withstand the harsh environment artificial reefs must endure. Each Reef contains more than 3/4 ton of Florida Limestone and provides more available surface for marine life than a single 5'x5'x5' Limestone boulder. Your Memorial Reef can be constructed with or without cremains. If you choose, you may permanently incorporate your loved ones' cremains into the Reef by mixing directly into the cement mixture. 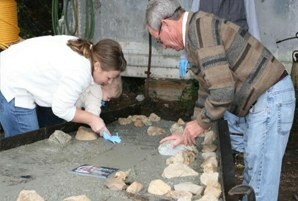 Additionally, family and friends are given the opportunity to personalize the Reef by creating handprints, inserting personal keepsakes and writing messages in the damp concrete Reef mixture before it dries. 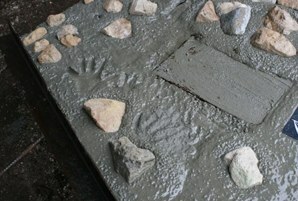 Items such as glass, metal, porcelain, rock, and granite can be placed in the cement to increase the personalization. Many loved ones feel this is a wonderful way to stay in touch for eternity. 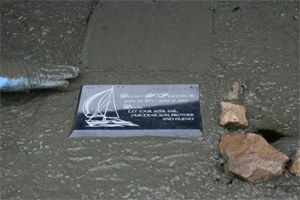 The plaque is placed directly in the concrete mixture at the center of the module and becomes a permanent part of the Reef. An inscription of your choice is engraved on the plaque. Once the sides have had time to cure in the metal forms, they are placed on a specially designed frame that prepares the structure for assembly. 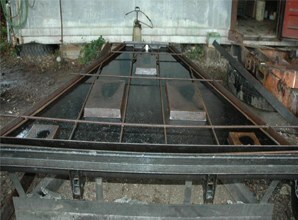 Rebar used during the initial pour is now welded on all sides, permanently locking the structure together. 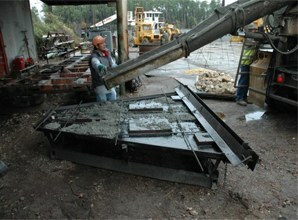 After welding, metal forms are attached to the 3 corners and additional concrete is poured, secured and allowed to cure. 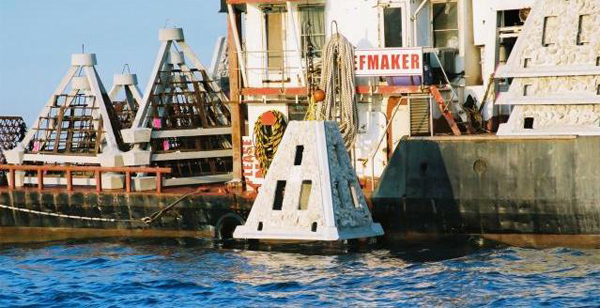 Once the reef is cured, it is removed from the brace and is ready for deployment. Once the Memorial Reef as been assembled, it has time to cure before deployment. Reefs will remain on site in a secure location until the scheduled dedication and deployment date. On the day of the scheduled deployment of your loved one's Memorial Reef, you can participate in the actual dedication/deployment ceremony. There are numerous charters available in the area that can provide transportation to and from the dedication ceremony. PLEASE NOTE: There are a number of challenges that can impact our ability to deploy the Memorial Reefs on the day and time we have scheduled. Reef building is a marine construction project and it can be impacted by weather, equipment and is highly dependent on the government. Wind and waves are always an important consideration and even tidal fluctuations can cause delays and prevent the memorials being safely placed. Our Commitment is that we will work with you to identify the most appropriate location, type and the timing of deployment for your Memorial Reef.